In the latest look at the underlying components of the S&P 500 ordered by largest market capitalization, Brown-Forman Corp has taken over the #311 spot from ABIOMED, Inc. , according to The Online Investor. The EU and Mexico retaliate with their own tariffs, and that is hurting whiskey makers. 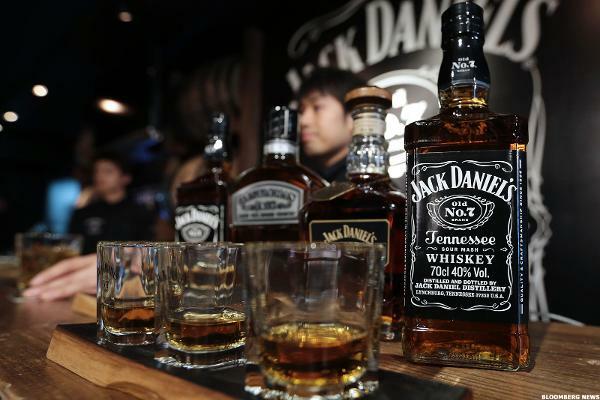 Charts suggest dispiriting days ahead for Jack Daniel's maker. Get ready for the week with Jim Cramer's Game Plan, including cybersecurity, discount retailers and Germany's industrial production data. One bourbon, one shot at the kind of bargain that doesn't happen that often. The Patrón and Avión tequila purchases likely will not be the last deals this year for producers of tequila, whiskey and gin. Spirits and wine maker's charts look positive. The fires have claimed at least 11 lives. Whiskey and tequila served up a strong performance. Constellation Brands hits new all-time highs on another earnings beat. For the time being, Jim Cramer is sticking with Constellation Brands over Brown-Forman. TheStreet's Action Alerts PLUS Portfolio Manager Jim Cramer previews Brown-Forman's earnings, released on Wednesday. Jim Cramer has the game plan for next week, including earnings from Thor Industries and HD Supply. Lowe's says it missed earnings expectations because it paid down a lot of debt. U.S. stock futures are marginally higher on Wednesday ahead of minutes from the Federal Reserve's last meeting, and after Moody's lowers the credit rating for China. Brown-Forman affirmed it was not interested in selling to the owner of spirits including Corona and Svedka Vodka. Adam Selipsky, president and CEO of Tableau Software, tells Jim Cramer about what this visual analytics platform can do for business. Jim Cramer is keeping an eye on quarterly results from Brown-Forman released on Tuesday before the markets open. On Tuesday, March 7, investors await quarterly results from Urban Outfitters. Is The 'Hard Asset' Concept In Need Of An Update? Will Tariffs & Costs Hurt Brown-Forman's (BF.B) Q3 Earnings?